Replacement WaveRIDER® NL 2+ Test Coupon. Newly designed it now includes an anchor which fixes the “Solder” sensor at a 2mm [0.08”] depth. 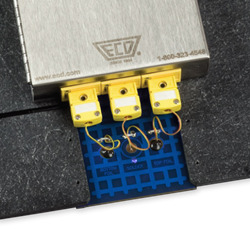 This provides optimum repeatability and a better representation of solder temperatures. Includes an anchor which fixes the “Solder” sensor at a 2mm [0.08”] depth. Note: This coupon can be used with any version of the WaveRIDER® pallet however, a shift in existing data should be expected. To maintain measured data sets, the Legacy design of the coupon remains available. Product is available as a Single or 3-Packs. Replacement WaveRIDER® NL 2+Test Coupons (3 Pack).